If someone told me I was going to sit on a 7+ hours flight to Australia, I was probably going to laugh. But as it seems I didn’t get the last laugh as I was indeed sitting comfortably in the spacious seat on row 15. And while the cabin crew was preparing the cabin for the flight I was trying to make myself feel more comfortable for the journey ahead. This may or may not included buckling my seat belt until that extend that breathing was difficult, exercising my grip – if it was needed to clutch to the armrests and finding the most convenient way to fall asleep. While I was busy with these extremely important tasks I completely ignored the fact there was another woman sitting next to me. The poor thing got few friendly elbow nudges (and all of them were accidental, I SWEAR) from me before she decided to switch seats, giving the whole row to me. In my defense I would say, she did move to another empty row, so it was a win-win situation. The pretty and comfortable Dreamliner. The previous night I didn’t sleep much, but this was because I wanted to be tired enough to be able to fall asleep on board. I patiently waited for the crew to make the last check before taxing off to the runway and loose my seat belt just enough so I can comfortably lay down to the side and turn the row into my makeshift bed. As a picky flyer I would examine everything connected with the airline and if I am not happy with the service I would never fly with them again, even if they offer free seats. (Ok, I would probably fly with them, but after I take some medication). For some reason I was avoiding flying with Scoot and if you ask me why I won’t be able to answer you. But when I received the opportunity to visit Australia, Scoot had the best deals and after little fact checking I decided to give them a try. I wasn’t expecting much, after all Scoot is a budget airline. But to be fair, it is Singapore Airline’s budget division so the airplane maintenance and crew training were up to a very high standard. It was my first time stepping into a Dremliner and I loved it. I am not particularly tall, but sometimes even I find it difficult to squeeze into the plane seat. And this is the time when I usually resort to unique yoga poses. In the Dreamliner there wasn’t such thing. With its spacious, soft and comfortable seats it was a really nice experience. After being on so many flights I kind of feel embarrassed to admit, but this was the first flight I actually got to use wi-fi. The only reason I avoided it for so long were the crazy prices, most airlines quote, per MB usage. With Scoot I purchased a 24 hour wi-fi pass that cost me around $30. At some places the connection wasn’t perfect, by what can you expect when flying over the ocean. Now, I can’t tell you much about the in-flight entertainment or food, because I fly cheap. And by cheap I mean, I don’t purchase anything I don’t need. So with the opportunity to sneak food on board (psst don’t tell the cabin crew) and with the wi-fi pass I purchased I didn’t really need to buy the food and entertainment package. The cabin crew were really pleasant and polite and always greeted us with a smile. I managed to get some good sleep and woke up just as we were about to descend for landing. And this is a big accomplishment for me, as being afraid to fly it is always very difficult to fall asleep on board. Sit next to me at your own risk as you may receive few friendly elbow nudges. Having in flight wi-fi is the best thing ever. 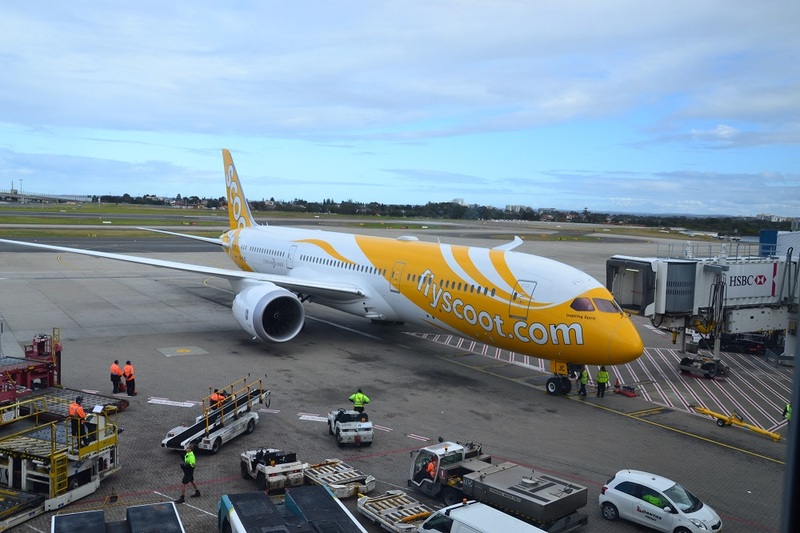 Even if you have fear of flying, I guarantee you will feel comfortable flying with Scoot.